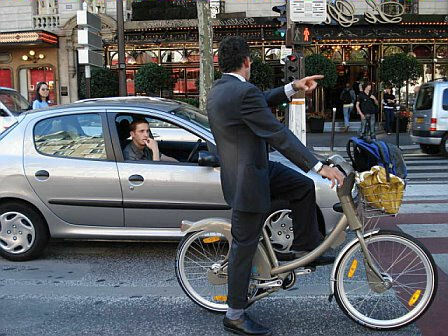 Paris has a sustainable transportation strategy. It is working pretty well and they continue to make steady progress on it, though with miles to go before they sleep. What makes Paris particularly interesting and instructive as a real world example is that for many years it did not, and by the early 70s there were first big infrastructure initiatives knocking at the door that would have certainly turned it from being a city for people into a city for cars. And that particular destiny, by the way, was not just a random series of events. It was premeditated, largely shared in policy circles and destined to happen. At the time, in 1974, the Prefect for Paris (Paris did not at that point have its own mayor and hence a focal point and guardian of that special qualities) famously said (in my approximate but not inaccurate memory) “Parisians are born with two legs and four wheels”. Oops! But somehow the city managed to escape that awful logic and the terrible destructive policy that would have ensued, saved by a massive public uprising to the government’s proposal to build a multilane urban freeway along the city’s historic and beautiful Left bank. Civil society prevailed and thanks to massive citizen involvement, it did not happen. Three years later the city got its first mayor, Jacques Chirac, and all evidence points to the fact that this led to more careful and sensitive governance. Today Paris has a world level — which does not mean it is perfect! — sustainable transportation policy such that, as Jan Gehl puts it so well, “we wake up everyday and as we look around we can see that our city is just a little bit better”. Which is not to say that there is not a great deal of work still to be done, but if you have a look at the following article by Alexandre Micheau you will see how one more important building block is being advanced, the challenge of reducing the number of parked cars and parking slots in the city is being attacked as a key element of the city’s sustainable transport strategy. Without a radical parking policy, your city is just kidding itself no high its professsions. Lets have a look at what Alexandre has to share with us. Since 1 January 2015, motorists in the capital must now comply with the new paid parking regulations. 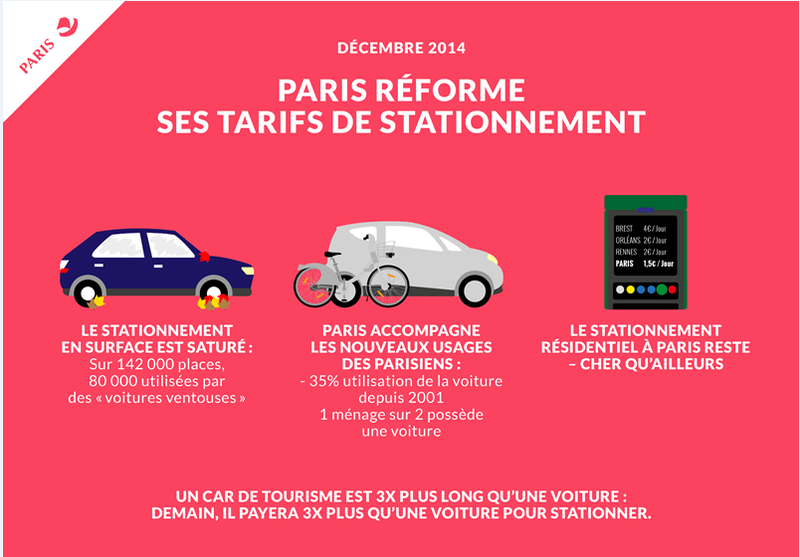 During the December 2014 Paris Council, the new municipal team voted in favour of significant rate increases, of which the main objective is to increase the rotation of parking spaces. This decision, which is part of the decentralization of paid parking act, is above all a strong sign from the local authority to encourage Parisians to change their transportation habits. The objective is not only to modify the use of the individual car but also parking behaviour. Up until now, due to a very low residential parking rate, the number of Parisians who own a car, that being 40% of households, were rather privileged. As a matter of fact, in addition to the annual parking card, which was free of charge, these rates increased to 0,65€ per day or 3,25€ per week, which is about 170€ per year. This scenario, which had initially been devised to entice the motorists not to use their car, quickly had an adverse effect. In effect, out of the 80 000 residential parking places in the capital, 60% of the vehicles did not move during the week and thus represented the so-called « ventouses » cars. As a result, residential parking became long-stay parking and the parking bay rotation rate was very low. It is estimated that a parking bay remains free on average for 1 minute in Paris and that 20 to 30% of the vehicles in traffic are permanently looking for one . This makes the daily parking exercise extremely complex. As for the numerous underground parking bays which could solve residential parking, they are often too expensive and less easy to access. 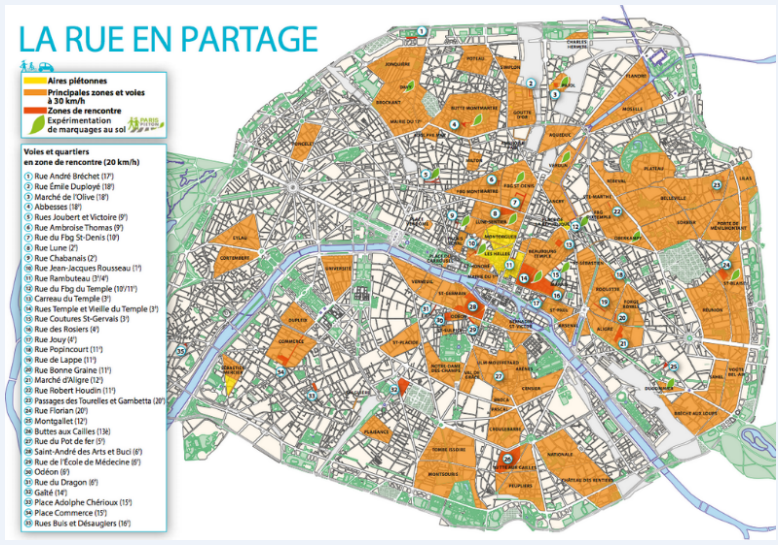 Similarly, the Parisian motorist is the worst off in the hexagon as the rotation parking payment rate is 14% in the capital, compared with 20 to 30% the average in France. This problem, on the one hand, explains the amount of the fine in the case of non-payment (which is fixed at 17€) and the weak control rate. It is simply not dissuasive enough. The low risk of being caught has slowly lead to a feeling of impunity. This is a direct consequence of the problem and is a significant shortfall. Faced with this realization, here are the changes that the new municipal team have recently voted in regarding the 142.000 paying bays in Paris. For all motorists, the payment period is henceforth extended to Saturdays as well as to the month of August, and extended by one hour in the day, from 19 to 20h. For residents, the parking card is payable from 1 February 2015, for an amount which totals 45€ per year or 90€ for three years. It remains, by contrast, free and non-taxable for residents and owners of electric vehicles or vehicles running on natural gas. Added to this are also strong increases in the daily rate of 0,65 to 1,50€, and the weekly rate of 3,25 to 9€. For comparison, the Paris city council reminds one that in Brest the daily residential rate starts at 4€, and 2€ in Grenoble, Metz, or Rennes. For visitors, the capital is henceforth divided into 2 zones instead of 3, with a simplified boundary along the borders of the arrondissements. The first zone, the so-called central, encompasses the first 11 arrondissements and sees its hourly rate increase to 4€ as opposed to 2,40€ for the second zone, which is more peripheral. Our European neighbours, Brussels and Copenhagen have also instituted a pricing policy per « zone», with rates lower than Paris, between 1,50 and 2,50€ per hour. London has distinguished itself by the implementation of its transport congestion charge since 2005 and applies higher rates of between 3 and 6€ per hour. Finally, in Madrid, the parking costs are progressive according to the stay and vary between 1,15 to 2,30€ for one hour. 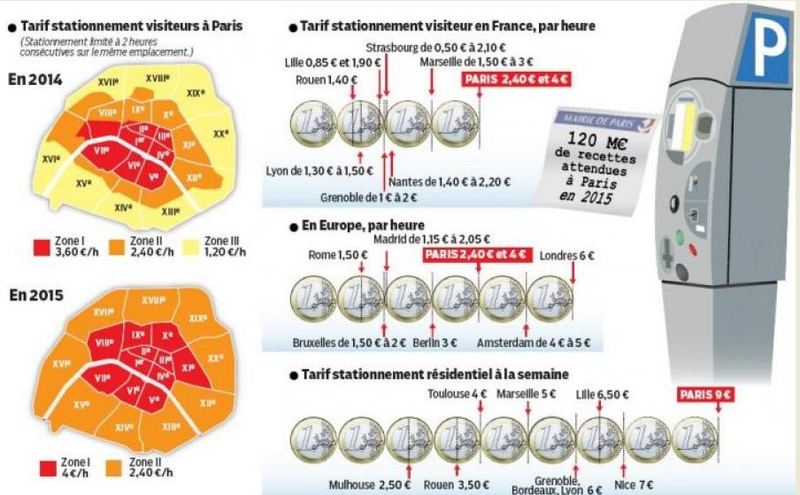 Comparison of parking rates in France and in Europe ©LP/Infographic M.G. Over the course of the last decade, the number of parking bays in the streets of Paris has been considerably reduced due to the new modes of « clean » transport. It is therefore estimated at twenty thousand, the number of parking bays which have disappeared, especially for the creation of Velib’ and Autolib’ stations. These new locations, which were initially criticized by the majority of parisian motorists, nevertheless contribute to improving and diversifying the transport solutions within the capital. Other obstacles have however been added to the parking problem. Amongst them, one can cite the decrease in the number of lanes in the main roads, the increase in zones restricted to 30 km/h, the partial removal of fast lanes along the banks of the Seine and the increase in one-ways, which have all contributed in slowing the traffic down. Despite this challenging situation, the city hopes to go further and declutter public space by favouring a better vehicle turnover. To do this, it hopes to encourage « motorists to make more use of the 82% of the parking bays situated outside of the public road », which should contribute to the local economic momentum. Rates for surface parking spaces are henceforth more similar to that of underground parking bays. Is this leverage enough to convince motorists to use the latter? The capital remains a more and more difficult place for motorists, as daily driving is often synonymous with stress and frustration. This new measure could lead to a greater number of Parisians giving up their individual car, even more so if new alternative services are offered to them. It is moreover predicted that the 55 million additional revenue generated by this reform will serve to finance new mobility projects, notably the creation of new cycling lanes. Parksharing is a good example of alternative services which have recently seen the light of day in order to respond to the parking problem in the capital. It consists of making available to motorists under-used private parking bays at certain hours of the day or night. There are actually countless spaces available at night in the parking lots of large distribution centers, companies, hotels or even parking operators themselves who want to optimize the use of their bays. Several companies have therefore come forward to do this, together with motorists, with this way of connected parking. Access is through an intermediary by means of a simple « pass » or via a smartphone. These new players act as service operators. Several offers are available, ranging from parking by the minute, through to monthly, evening and weekly subscriptions for residents, and daytime subscriptions for workers. 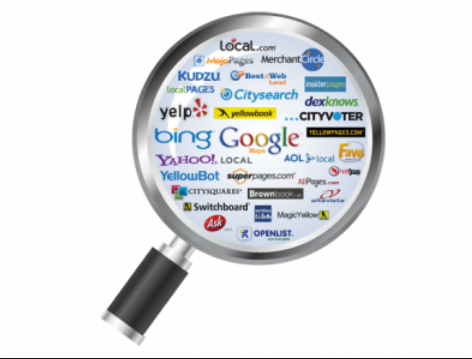 Payment by the minute is one of the major innovations of these new services. At the moment, the two main operators of parking in the capital, Vinci Park and Saemes, have not adopted it. There are several hurdles, mostly legal, since most of their parking bays are under public service delegation contract. This new type of pricing system had however been voted in by the senators in September 2013, only to be ruled out by the MPs in February 2014, and replaced by payment per quarter hour. Expected for a long while by motorists, this facility will come into effect on 1 July 2015 for underground parking, before being extended to surface parking in 2017. However the advantages of the new « parksharing » services do not stop there, as one is offered the opportunity to check the availability of spaces in real time, to make a reservation and to benefit from an automatic payment via mobile phone. The second alternative to street parking is relatively similar since it involves renting parking bays of private individuals. 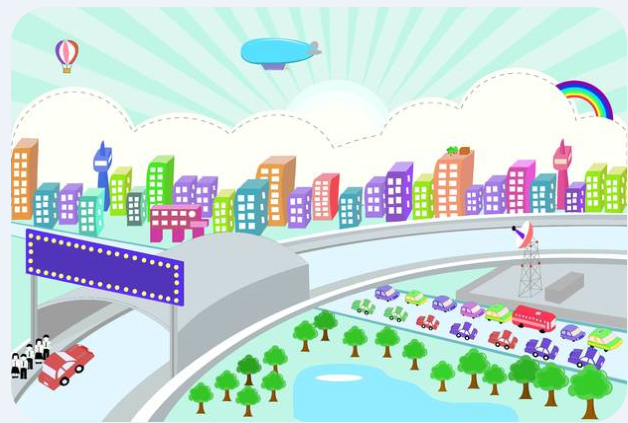 Surfing on the wave of collaborative economy, several online parking sharing communities have been developed, in the same way as sharing a house or car. This alternative has great potential since it is today estimated that about 60% of the 800 000 parking bays in the city of Paris belong to private individuals. This is a potential of 500 000 bays to share and optimize. Despite the appearance of these new types of shared parking, the global cost of owning a vehicle in Paris never ceases to rise. Added to this, of course, are the constraints of traffic, which is becoming worse. Similarly, the image of the car has evolved and it is no longer a vital social symbol since less than one household out of two owns one in Paris. It is therefore becoming more and more reasonable to question the principle of owning a car. A Parisian is now, more than ever, encouraged to use a car, as a service. Available in Paris and in 60 metropolitan towns, is the Autolib’ service, which sees close to 70 000 active subscribers per year in the Ile-de-France region and is, by its magnitude, the most well-known. It enables one to make short trips. 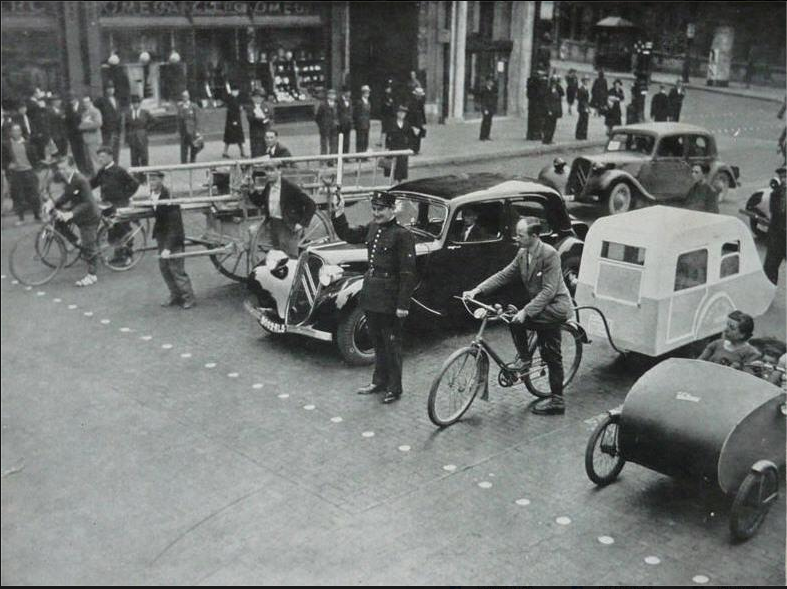 Other forms of car sharing have also been developed to respond to various needs. 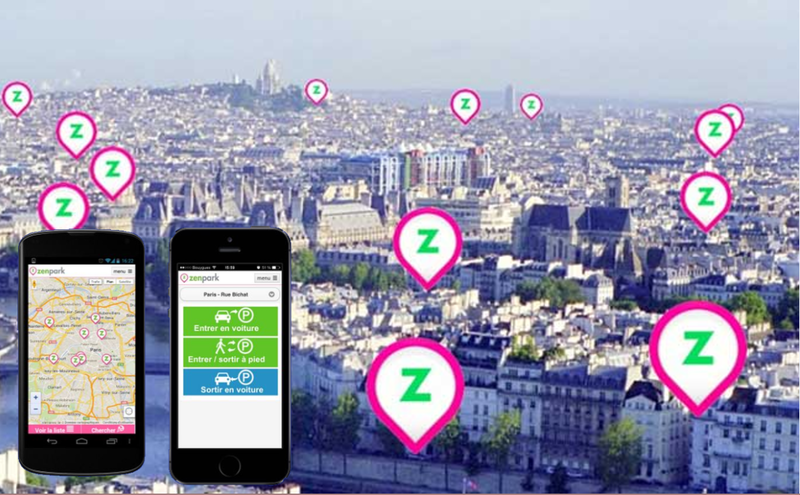 Mobizen and Zipcar offer hire cars available 24h/24 7j/7, with a rate per hour or day and access to a simple vehicle with a badge or a smartphone. To make short trips over longer distances of the weekend or holiday variety, it is also possible to have access to platforms where one can rent vehicles amongst individuals. Drivy, which is the leader in this sector, offers rental vehicles belonging to residents in your suburb or even to your neighbour at a bargain price! This collaborative momentum extends even further to sharing trips with multiple forms of carpooling. In addition to these occasional offers and long-distance trips that one recognises from the success of BlaBlaCar, new alternatives are beginning to appear for short and regular trips of the « home-work » variety. This sector has not had enough advertising but however represents the essential trips made by car, with, in the majority of cases, a single driver on board. Wayz-up and Wedrive are also trying to develop this type of practice by taking into account specific salary constraints. In the future, « dynamic » carpooling should also evolve, as UberPool or Karos have already experimented. This new type of carpooling also allows travellers to be informed in real time and in any place of drivers following the same itinerary and hoping to share a part or all of their journey. These new services characterise the evolution of the place of the car in our daily trips. More than reducing the use of the personal car, they point to a behaviour change, characterised by an increase in trips by foot, bicycle or public transport. 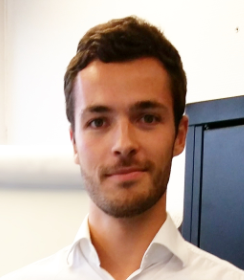 As a consultant at Inov360, Alexandre Micheau is focused on supporting startups, medium size companies, large corporations and local authorities on innovative projects in the world of new mobilities, smart cities and sustainable environment. He has gained 5 years of experience in the automotive industry in marketing, strategic and consulting positions. He understands the business and strategic implications of new technologies in the mobility eco-system. Contact: alexandre.micheau@inov360.com This article originally appeared in the blog of Inov360 on 17 March 2015. This entry was posted in * Parking, 2015, New Mobility and tagged * Better Choices, * Parking, * Sharing, *Safe City 2020, *Shared/Mobility, 2015, CarFreeStrategies, City cycling, Congestion, SlowMobilityPrimer, The Third Force, Traffic, Velib case study. Bookmark the permalink. Miguel Ángel Mancera, jefe del GDF debería lanzar una invitación similar, y simultáneamente debe anunciar una serie de acciones que coadyuben a disminuir los autos en la calle y así mitigar el tráfico y congestionamiento, y eliminar la necesidad de hacer obras viales faraónicas, que lo único que conseguirán es la atracción de mas autos y la creación de tráfico inducido.